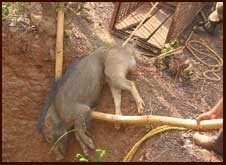 Aizawl, Feb 26 : A male wild boar entered a village in eastern Mizoram on Wednesday morning and injured five people, three of them grievously, before villagers shot it dead. Village leader C Lalnunpuia said the wild boar entered Saichal, within Champhai district, from the nearby woods around 9.45 am, chasing a woman who was coming from the same direction. As it reached a house on the outskirts, it attacked a group of women sitting on the porch. One of the women, identified as Lalruatliani, sustained wounds on her hands and arms, with several fingers broken. Another woman, Pi Kawli, sustained wounds in the back, while the third woman, Lalrampari, was wounded in the chest and legs. Two men who came to the women’s aid were also injured before one of them could hit the wild boar with an axe. The animal fled after it was wounded, and another villager chased after it and shot it dead near the village graveyard, which adjoins the woods. Lalnunpuia, president of the village’s Young Mizo Association unit, said the wounded were being shifted to the Aizawl Civil Hospital, about five hours by road. Fanaia Fanai, another village leader, said it was rare to find wild boars roaming in the area and that he has not seen one himself in recent memory although he regularly goes to the woods and adjoining farmlands.